Eye care professionals specialize in understanding how the human eye really works, as well as diseases and conditions that affect your vision - many of which do not have obvious symptoms. The eye doctors at Mondo Optical know how age and risk factors affect vision over time for young and old, and they understand the benefits and features of corrective lenses including eyeglasses and contacts. Our optometrists in Clay, NY takes the time to explain the results of your eye exam, describe your options and listen to your eye care needs. Because maintaining good eye health is an ongoing partnership, we encourage you to ask questions and share your health information, which could be vital to monitoring, diagnosing and treating potential vision problems. Dr. Anthony Mondo was born in Messina, Italy and raised in Central New York where he graduated from Christian Brothers Academy in 1982. He then acquired his Associate’s in Applied Science degree in Ophthalmic Dispensing from Erie Community College. 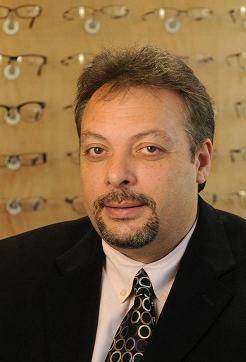 Dr. Mondo began his career in the optometric field as a New York State licensed optician. He continued his education at South Eastern University in Miami Florida where he received his Master of Science in Applied Optics. This was followed by earning a Doctor of Optometry degree from Nova Southeastern University where he graduated with honors in 1996. During his clinical eye exam training he was fortunate to extern at Bascom Palmer Eye Institute which has been rated the #1 eye hospital in the country as published in U.S. News & World Report’s. Upon graduating, Dr Mondo returned to the Central New York area and began his Optometric career at Eye Physicians of Cny. As well as holding a position at Eye Physicians he has been in private practice since 2001 when he first founded Mondo Optical. Dr Mondo has an office in Clay and has recently expanded to the Syracuse area where his Amory Square office opened in the summer of 2011. Dr. Mondo is a New York Sate Licensed Optometrist who is trained to diagnose and treat ocular diseases, including glaucoma. His commitment to his patients is to provide excellence in eye care by ongoing professional education and using the latest technology in his practice. He is a current member of the American and New York Optometric Associations and has also served as president of The Central New York Optometric Society. Dr Mondo supports his local community through charitable donations to schools and community auctions and events. Dr.Mondo is the father of three loving children. He enjoys cooking, travel and spending time with friends and family.